What is Full Moon Folk? Full Moon Folk is a folk night held at historic 'Redlands' (originally a Blue Mountains guesthouse). The nights are a gathering of our musician friends – and friends who love music – the 'Silver Circle'. The concerts are free – but we do ask for a donation of $4 – per person – to help cover the costs of hiring chairs, wine glasses and miscellaneous expenses. Please bring a plate and the beverage of your choice. Children are welcome! Young ones may have to sit on cushions if it is crowded. Full Moon Folk is a 'No Screen Zone' – children and teenagers are not allowed to play computer games or watch TV during a FMF night). Time: 7:00pm (music starts at 8:00pm and ends at 10:30pm on weeknights, with an interval at about 9:00pm. We sometimes finish a bit later on Friday and Saturday nights). 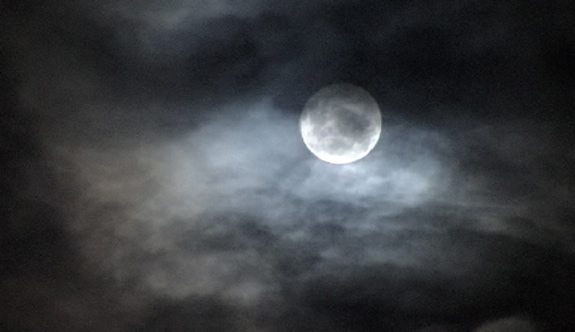 Performers should note that we intend to document Full Moon Folk in a series of podcasts. We will only release material that has your consent and doesn't breach copyright laws. Nigel's guitar students are welcome to play a tune or two at Full Moon Folk – by prior arrangement. To ensure a seat, please RSVP Nigel promptly when you receive the invitation email – we often have a 'full house'. Bonnie Ross – a harp student of Dawn's making her Full Moon Folk debut! William Louis – brilliant seven year-old banjo player who steals our hearts every time! Ryan Tremble – knowledgable young musician who plays preloved guitars with flair! Dawn Egan – folksinger/harper – haunting melodies from the windswept fields of time. Another Blue Moon (our third) graced the night as some of the Blue Mountain's finest musicians and songwriters cast their spell upon us on the last night of Winter – sorry we couldn't fit everyone in! Thank you to all the musicians! This Full Moon Folk was a bit of an 'Aries night', celebrating the birthdays of Karen Lynne, Pat Drummond and Nigel Foote – as well as some members of the audience. The music was sensational! Another great night of songs from the sixties – thank you to all the musicians for your contributions – we were really treated to a fine evening of music and laughter! A wonderful trip back to the sixties! Songs of peace and hope – lots of people missed it and have asked us to do it again. Pat Drummond – Australia's Pete Seeger! Brilliant performances contrasted with a rather cold and drizzly night outside. Great to see the young folk's high standard of performance and musicianship, plus some memorable moments from the established artists. Thank you to everyone involved! What a great night, and such a treat to have Kate Rowe and Ryan Morrison play for us before their second tour of England with the Spooky Men. And another big thank you to Allan Caswell for filling in for an injured Pat Drummond. Happy Birthday Simon! The performers played to the biggest audience yet, as 'Full Moon Folk' returned after a four-month break. It was a lovely, still night, and the music was awesome! It was a special treat to have ex-mountaineers, Andrew and Lisa (down from Lismore) for to play for us. Wow, what a special night – what a powerful finish to the year! A total lunar eclipse on the Summer Solstice – the last time that happened was 21st December, 1638! The Foote Family would like to thank all the musicians and friends for making the first year of Full Moon Folk such a success. We started the year with a Blue Moon and finished with an Eclipse! Allan Caswell – a "master songwriter" singing songs from his new album "Behind Bars"
James Church – gifted musician – plays dobro like he was born to! Martin Foote – anyone who performs "Classical Gas" on debut has served notice! Nigel Foote – "and the wind in the pine still sings beneath my fingers"
Another 'Full House' was treated to some really wonderful moments – thank you to all the musicians for sharing your music simply for the joy of it! I booked fewer artists this time as the nights have been running a bit late. A small but enthusiastic audience (about 30 people) enjoyed one of the very best nights of music we have had yet – outstanding! What a pleasure it was to have Glenn Skarratt make his first appearance at Full Moon Folk – back soon I hope! The moon blessed us with her silvery presence, and another night of music and friendship was shared by all – finishing at midnight with Simon Watts playing his fiddle and then leading us down the hall – Pied Piper fashion – and out into the street to gaze at the moon – brilliant night! Thank you one and all. Karen Lynne & Martin Louis – with young William Louis on ukulele! As the night was dedicated to the memory of Sam Griffin (one of my students), it was fitting that the music was of such a high standard. A special thank you to all the musicians and friends who made it such a beautiful night. Another good crowd turned up to enjoy some fine folk music and celebrate Kate Rowe's Lennon Award win. Thank you to all the musicians for your great songs and tunes, and to the audience for supporting these nights to help make them such a success! What a great night – one of the best – thank you everyone! The beckoning of Winter blessed us with a clear night and our first shining full moon! The music was superb as usual. Full Moon Folk – 30th March, 2010 / Our second Blue Moon! Another great night of first-class music, performed by some of Australia's finest singer-songwriters and musicians at 'Redlands', Katoomba. The second Blue Moon in three months was not visible due to a rainy, misty, mountains night – but about 40 folk turned up to share an evening of good music and cheer – one of the best nights yet! Thank you to all the musicians who cast a spell upon us, and to our friends for your warm company. A wet Monday night didn't dampen the spirits of over 40 hardy souls who attended the second concert in the Full Moon Folk series, organised by Nigel Foote and Dawn Egan. Thanks again to all the performers and friends who made it such a memorable evening! Some of Australia's finest songwriters and musicians, plus a circle of friends, gathered in Katoomba at the invitation of Nigel Foote and Dawn Egan, to launch Full Moon Folk. It was a Blue Moon, a 'Full House' and the night was a great success! Nigel and Dawn would like to thank everyone for their company and contributions to the evening. "Thank you to all the musicians who shared their music with us, and thank you to Steve Norris and Michael Small who captured the atmosphere of the evening with some wonderful photographs, some of which will be displayed in the Photo Gallery shortly". Lachlan Foote – Having grown up in the Foote household, it's perhaps no surprise to find that Lachlan plays guitar. Lachlan (and his brother Martin) have heard Nigel's students having lessons in the kitchen or living room every single week of their lives. They have probably learn't to play as much by osmossis as by the lessons their father has given them. Jim Jarvis – If you missed Jim's last performance at FMF here's your chance to catch one of Australia's finest folk-blues guitarists. "He carries with him echoes of Bert Jansch, Davy Graham, John Renbourn, John Martyn, Bill Broonzy, John Hurt, Arthur Crudup, Robert Johnson, Jelly Roll Morton and Leadbelly, Jackson C Franks and Steven Stills". Jim Low – Recently signed to Rouseabout Records, Jim writes and sings songs about Australian characters and towns with the perception - and yearning – of a man in touch with the passing of a simpler time. His new album, 'The Further I Travel', comes wrapped in the gentleness of a magpie greeting a country morning. Martin Louis – Highly respected 5-string banjo player (three times National Banjo Champion) and member of bluegrass band Acoustic Shock, and Karen Lynne's Bluegrass Circle. Martin teaches banjo in Wentworth Falls. Karen Lynne – Karen's latest album, 'Heart Songs', confirms what many have believed for a long time – this woman has one of the finest voices in the country! With a string of albums and awards to her name, Karen has stamped her mark on the country-folk genre (and left her hand-prints in wet cement in the 'Hands of Fame' walk in Tamworth). As the seasons have flown, Karen has leaned more and more to bluegrass, epitomised by her band, the Karen Lynne Bluegrass Circle. Nick Szentkuti – Singer-guitarist and member of 5 Leaves Left. Nick has moved to Sydney now, but will while he was here, he was one of the driving forces of the folk scene in the mountains. A warm and engaging performer, Nick mixes original songs with Celtic and other traditional tunes, fingerpicked on acoustic guitar (Nick was a student of Nigel's).